Several news headlines this week have heralded the “unstoppable” decline of a major portion of the West Antarctica ice sheet in the Amundsen Sea, eventually disappearing in as little as two centuries. Projections for the complete collapse of the West Antarctic ice sheet range from two hundred to nearly nine hundred years, but what is clear is that ice melt in this region of the southern pole is happening quicker than expected. Scientists may have underestimated the speed of the glacial decline revealed in new NASA research studies, but the vulnerability of the ice has been understood for decades. And it’s only become more so since then. With the ice sheet grounded below sea level, ocean currents bring relatively warm water to the “grounding lines” of glaciers in the Amundsen Sea, where the ice attaches to the seabed. This warm water eats away at the ice, pushing the grounding line further inland and diminishing the mass of the ice sheet. This loss of mass prevents these seabed-anchored glaciers from holding back inland glaciers in their relentless march to the sea. This, combined with the peculiarities of the geologic features, particularly the precipitous downward slope of the land without any hills or mountains to brake the advancing ice, makes the region particularly vulnerable to what scientists have suspected. The new research confirms this vulnerability and portends an “unstoppable” chain reaction of diminishing ice. It’s a feature of a fundamental natural cycle, but human influences appear to be accelerating the process. West Antarctic ice melt, natural cycles or manmade? The rate of ice loss in the region has accelerated 77 percent since 1973. Nonetheless, using the word “collapse” puts in mind a sudden disappearance of ice. Even the current worst-case scenario puts the total disappearance of the ice in the region two hundred years hence, maybe even nearly one thousand years. Why worry about something so far into the future? Pennsylvania State University Geoscience professor Sridhar Anandakrishnan cautions that even the apparently slow decline of ice in West Antarctica can have significant impact this century. 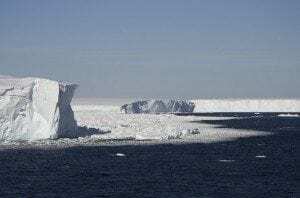 The Intergovernmental Panel on Climate Change (IPCC) has generally been a bit gun-shy on projecting sea level rise, particularly wary of predicting changes in sea level caused by ice melt in Antarctica. Current projections from the latest IPCC climate report estimate sea levels could rise from 1 to 3 feet by the end of the 21st century. Even assuming the low-end of that estimate could displace tens of millions of people along coastal areas around the globe. “So as this paper and others come out, the (U.N.) numbers for 2100 will almost certainly lean closer to 3 feet'” Anandakrishnan said. He also added that melting in the Amundsen Sea could destabilize other ice sheets in West Antarctica, which, according to NASA, contains in total enough ice to add 16 feet to global sea levels.